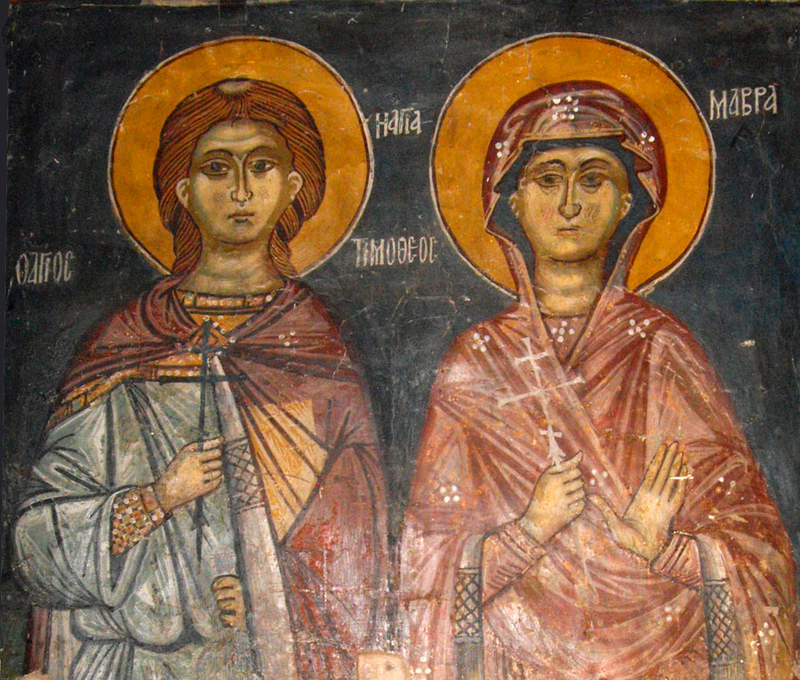 Saints Timothy and Maura suffered for the faith during the persecution under the emperor Diocletian (284-305). 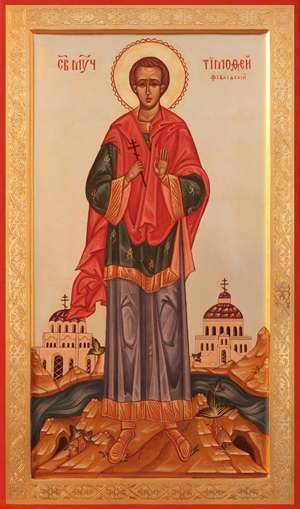 St Timothy came from the village of Perapa (Egyptian Thebaid), and was the son of a priest named Pikolpossos. He was made a reader among the church clergy, and also a keeper and copyist of divine service books. St Timothy was denounced as a keeper of Christian books, which the emperor ordered to be confiscated and burned. They brought St Timothy before the governor Arian, who demanded that he hand over the sacred books. They subjected the saint to horrible tortures for his refusal to obey the command. They shoved two red-hot iron rods into his ears, from which the sufferer lost his eyesight and became blind. St Timothy bravely endured the pain and he gave thanks to God, for granting him to suffer for Him. The torturers hung the saint head downwards, putting a piece of wood in his mouth, and they tied a heavy stone to his neck. St Timothy's suffering was so extreme, that even those who tortured him implored the governor to ease up on the torture. About this time they informed Arian that Timothy had a young wife named Maura, whom he had married only twenty days before. Arian ordered Maura to be brought, hoping that with her present, they could break St Timothy's will. St Timothy urged his wife not to fear the tortures, but to follow his path. St Maura answered, "I am prepared to die with you," and she boldly confessed herself a Christian. 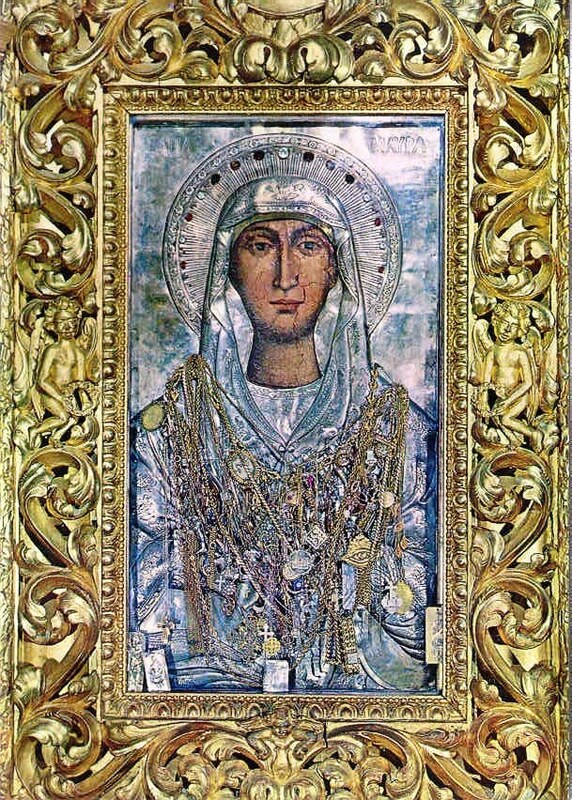 Arian commanded that the hair be torn from her head, and to cut the fingers off her hands. St Maura underwent the torment with joy and even thanked the governor for the torture, which she endured so that her sins might be forgiven. Then Arian gave orders to throw St Maura into a boiling cauldron, but she did not feel any pain, and she remained unharmed. Suspecting that the servants had filled the cauldron with cold water out of sympathy for the martyr, Arian went up and ordered the saint to splash him on the hand with water from the cauldron. When the martyr did this, Arian screamed with pain and drew back his scalded hand. Then, momentarily admitting the power of the miracle, Arian confessed God in Whom Maura believed as the True God, and he ordered her to be released. But the devil still held great power over the governor, and soon he again began to urge St Maura to offer sacrifice to the pagan gods. Having gotten nowhere, Arian was overcome all the more by a satanic rage and he came up with new tortures. Then the people began to murmur and demand a stop to the abuse of this innocent woman. But St Maura, turning to the people, said, "Let no one defend me. I have one Defender, God, in Whom I trust." Finally, after torturing them for a long time, Arian ordered the martyrs to be crucified. For ten days they hung on crosses facing each other. On the tenth day of martyrdom the saints offered up their souls to the Lord. This occurred in the year 286. Later, a solemn celebration of the holy martyrs Timothy and Maura was instituted at Constantinople, and a church was built in their honor. And deserved to be crowned by God. For He is a powerful stronghold for the faithful!